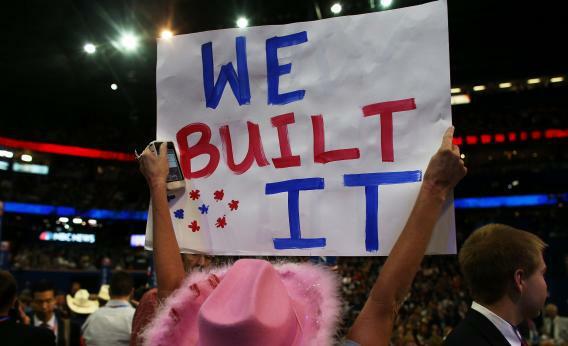 We Built It: Out of context or not, it resonates with Republicans. Stop Giving Us the “Built It” Quote in Context. No One Cares. There’s something willfully obtuse about repeatedly pointing out that the Republicans’ new favorite rallying cry of “We Built It” is based on some creative editing of a badly made point, as if every partisan in Tampa need merely to be corrected on the fact of the matter. No, Barack Obama was not actually saying that all of your achievements are attributable to the The State’s endless benevolence. Yes, the quote Republicans prefer is missing its rather clarifying middle. And yet it’s not clear that if this were patiently pointed out to your modal conventioneer, said conventioneer would throw down his “We Built It” sign and fly home in a rage. The slogan summarizes what Republicans take to be a substantive distinction between themselves and the other side. Even if it’s not what Obama said, it’s what he believes, what all Democrats surely believe, as they walk around handing out the participation trophies that will destroy civilization. This is not terribly different from a Democrat believing, in the face of any available evidence, that any particular Republican must be either confused or racist. Two moderates terrified of senior citizens are running for president. A clash of civilizations story wasn’t going to tell itself. Republicans need something to run against, and they found it in a quote that affirms everything they already think to be true of their benighted fellow Americans. Some people can deliver this message, such as it is, better than others. Last night’s early speeches were reminiscent of a lesson Rick Perry taught us months ago: Basic public speaking skills are not a prerequisite for holding public office. Natural human cadences were in short supply. Some very presidential-looking men took the stage and emitted presidential-sounding things that were probably words. But if it’s hard to believe Sen. John Thune ever built anything without hired help, New Mexico’s Susana Martinez—a governor so likeable little girls apparently run up and hug her—can tell a credible story about individual achievement, and tell it well. (She’s also the first person to tweak the trope in a remotely clever way: “$5 trillion in national debt. He did build that.”) And if you want someone to say “government stood in my way,” Condoleezza Rice, for whom government first took the form of Jim Crow, is a pretty good message bearer. She gave a speech, the first I’ve seen from the convention, that did not attempt to portray the speaker as heroically average, unassuming and given to aphorism. Her formal oratorical style—and I speak, of course, only relative to the other speeches—involved sentences with more than one clause, some multisyllabic words, and a shocking mention of structural barriers to success. Some people won’t be able to build it, evidently, because they’re warehoused in disastrously bad public schools. Paul Ryan, who was supposed to be the mathematically competent intellectual heft standing somewhere behind the president-shaped hole that is Mitt Romney, dumbed it down even by convention standards. He came off, to me, as a sad-eyed college Republican reading a children’s book. He spoke very slowly and in short sentences full of distortions Dave Weigel patiently enumerates here. Rice’s speech was also full of distortions, but I prefer my lies delivered in high academic style. For what it’s worth, progress-wise, the only person not afraid to appear intelligent last night was a woman.